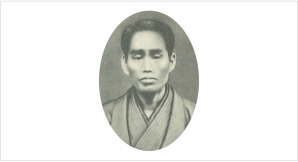 We would like to introduce the 100 year history of Nomura Trading group through the words and episodes of our founder, Tokushichi Nomura, which has become the base of our group’s Corporate philosophy system. 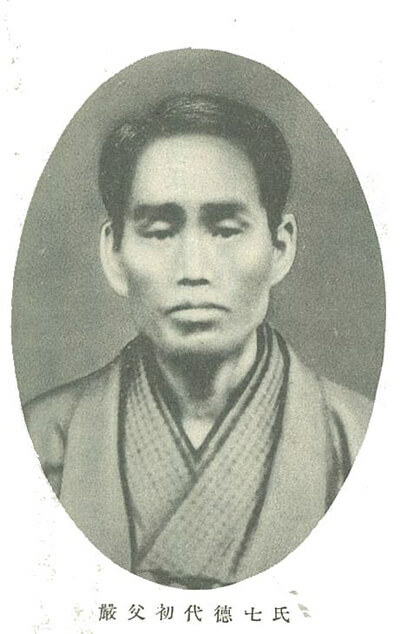 What was education like for the founder, Tokushichi Nomura (2nd generation), who received discipline from his father Tokushichi Nomura (1st generation) and mother Taki? Details on how Tokushichi Nomura began modern stock brokering business ahead of the times. ・Belief is the origin of all businesses. ・Rights, not profit should be contested. ・A customer’s profits should be placed ahead of self profits, etc. The trade which began with export and import between the South Pacific expanded to various parts of Asia. 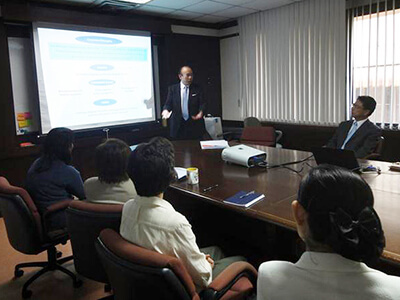 A decision is made to become the first Japanese company in Brazil through farm management. An episode in Japanese history where the words Makujiku-shinzen can be found. 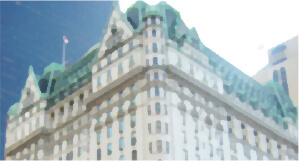 Post-war, Nomura group was targeted during the dissolving of conglomerates, and embarks as the new Nomura Trading. From a newly-estabilished merger, Nomura Trading expands overseas locations and joint-ventures into the 1960s. The severe time called trading company winter time was overcome. We survive the downfall of trading companies which started with the Asian currency crisis. Episode of the Tokushichi Nomura statue in the Nomura trading Tokyo head office reception. Chapter 4 Brighter Future. Achieving Together. The signboard of a general trading company is maintained and various business deployment is continued. We looked back to founder’s idea and made the new corporate philosophy system. 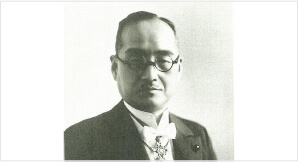 The founder of Nomura Trading, Tokushichi Nomura II (Childhood name: Shinnosuke) was born on August 7, 1878 (Meiji 11), to parents Tokushichi Nomura I and Taki. 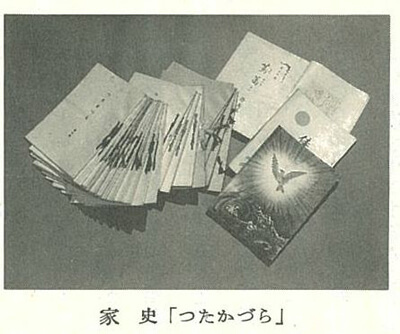 The money exchange business “Nomura Shoten” started in 1872 (Meiji 5) by Tokushichi Nomura I is said to be the beginning of all of the current Nomura group companies. Tokushichi I was a native Osaka merchant following the Osaka Shonindo (the Osaka merchant way), and considered good faith and steady trade as his moral code. As a man full of duty and honor, he was family-minded, and full of sincerity. Taki was a courageous woman who came from a samurai household, and educated her children in Bushido (the way of the Samurai). She also had deep faith in Buddhism. Shinnosuke’s ethics which were to lead him through his life were fostered by the discipline of these parents. Soon after Tokushichi Nomura II succeeded “Nomura Shoten” in 1904 (Meiji 37), he begins the modern stock brokering business ahead of his time. In this era, a stock dealer was considered to be the same as a gambler, which led to him being called “stock seller” and “gambler” by others. 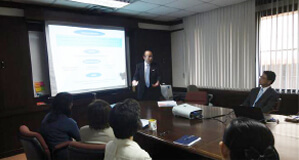 Tokushichi challenged the stock industry by adopting modern management principles. He took an overseas trip to the West, in order to learn the most advanced brokerage principles, and successfully defeated traditional customs. What should be noted most was the establishment of a Research Department and publication of the “Osaka Nomura Business Bulletin”, which informed customers about investigation results. With detailed scientific-based research and a publication that publicized these investigations, he succeeded in reassuring customers when purchasing stock. This management policy, which was based on sincerety towards customers, and focused on “coexisting and propering together with customers”, is the foundation of the management concept system of the current Nomura Trading group. He also focused on employing talented graduates from universities and female employees during a time where apprenticeship was the norm, and placed emphasis on a person’s education. Nomura Shoten, now under managed under modern principles, quickly obtained trust and expanded, and by the time the Russian-Japanese War (1904-1905) and World War I (1914-1918) had ended, had accumulated an immense amount of assets and fortune. 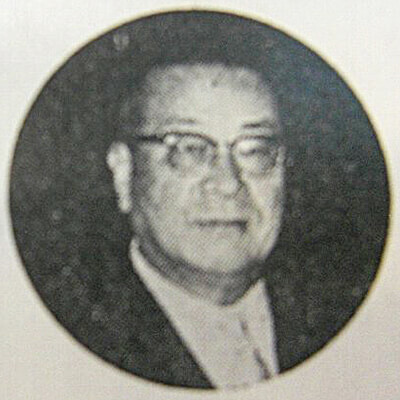 Tokushichi Nomura II, who succeded as a stock broker, decided to advance into the industrial field, and the first item considered was overseas business. “Belief is the origin of all businesses”. “Rights, not profit should be contested”. “An entrepreneur must have the courage to push forward against 30 percent non-certainty, in the case they have 70 percent scientific certainty”. “If you are to accomplish the business like a machine, it can be accomplished without the power of oneself”. “There is an abundant amount of sunlight in the south. Many natural crops are there”. Source: Tsutakazura (The Autobiography of Tokushichi), etc. These words were quoted when current President Miyashita of Nomura Trading spoke to employees immediately after taking office in July, 2010. Tokushichi Nomura decides to participate in a two month trip planned by Osaka Shosen to Taiwan and the South Pacific, beginning in April, 1916 (Taisho 5). While on the trip, Tokushichi focused on touring a sugar factory, a coconut plantation, a rubber plantation, among others, and after returning home devoted himself to studying South Pacific business. He documented all of these findings in a 200-page book, called “Rubber and Coconuts”, and sent a specialist in tropical agriculture to Dutch East India (present day Indonesia) for the on-site investigation. After recieving results of an investigation on a rubber plantation for sale, he decides to purchase the plantation. 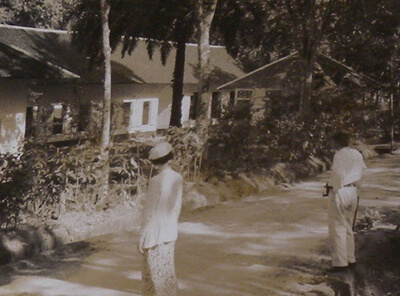 On May 7, 1917(Taisho 6) “Nomura South Sea Enterprise Division” was set up within Nomura Shoten, and Danau Salak plantation in Borneo was purchased on July 6 of the same year. This is considered to be the very beginning of Nomura Trading, and the date is now celebrated as the founding date. For Nomura Shoten, overseas business, let alone farm management, was an unknown field of business, and family members as well as others running the business together were opposed and worried. However, with a strong will he patiently persuaded the others and decided to take the step forward. It was a moment where Tokushichi Nomura’s favorite words “Makujiki-shinzen” could be seen in his actions. This pioneering spirit, as seen in this “Makujiki-shinzen” event, is one of the core values inherited by Nomura Trading, and is now a guide that serves to connect the company with the future. 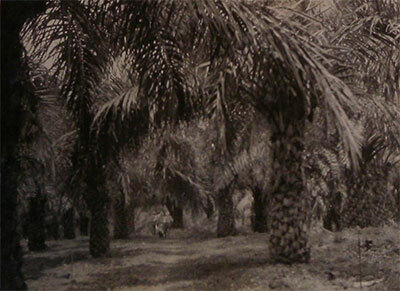 Danau Salak Plantation, along with the plantations purchased after that, were named Nomura Plantation. 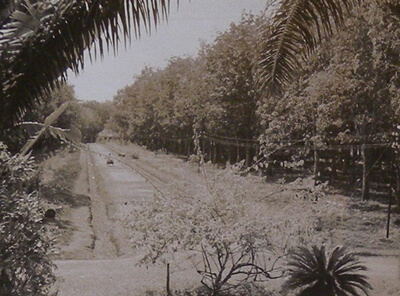 In 1920 (Taisho 9) “Borneo Rubber Industry Co., Ltd.” (later renamed “Nomura East India Shokusan Boueki Co., Ltd.”) was established and farm management was handled by this company. 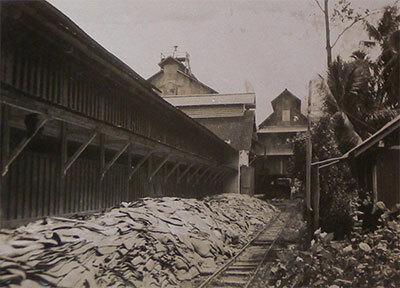 The following year, a factory which refined wet rubber similar to the local small holders were also constructed. 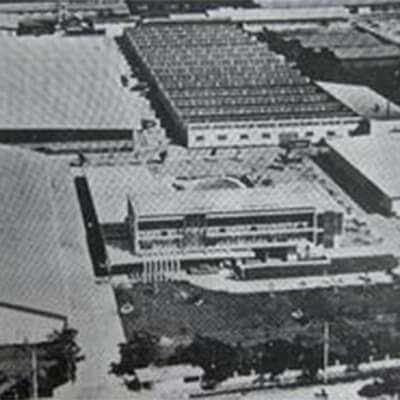 In 1924 (Taisho 13), “Singapore Nomura Shoten” was founded and began individually exporting rubber products of the Nomura plantation and refining factories. After this, they also begin managing palm oil farms and coffee farms. 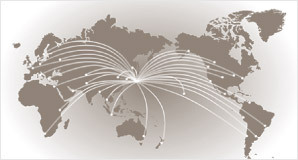 The Nomura business in South Asia became a highly diverse business in a short period of time. Nomura’s many farms and factories in the area eventually develop into becoming the largest. The key feature of this business was strong benefit programs for the laborers, aimed at existing and prosering together with the local residents. This was a big driving force of the company’s development. “Japanese companies in Dutch East India merely buy products here and send them to Japan, or sell things here brought from Japan; they are what are called a middle broker. 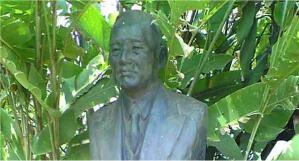 On the other hand, Nomura invests capital into the land and is doing work to exist and prosper together with the locals, following the policy of the government.” The only post in Nomura group which Tokushichi Nomura refused to leave until the end was president of “Nomura East India Shokusan Boueki Co., Ltd.”. 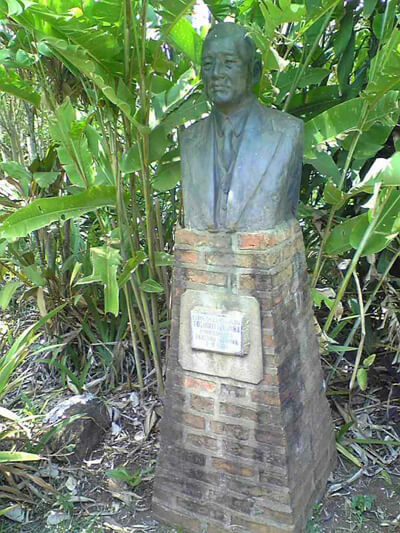 This is how much passion he had for the South Pacific business, but after World War II and the dissolving of the Japanese conglomerates by GHQ, Nomura’s property and assets in the South Pacific were confiscated and the business was forced to end. Tokushichi passed away seven months before that on January 15, 1945 (Showa 20), still worrying about the people who remained in the South. 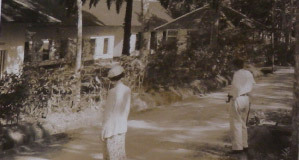 The building on the left is the plantation hospital. ”Makujiku sinnzen” is a word considered to be the motto of founder Tokushichi Nomura. 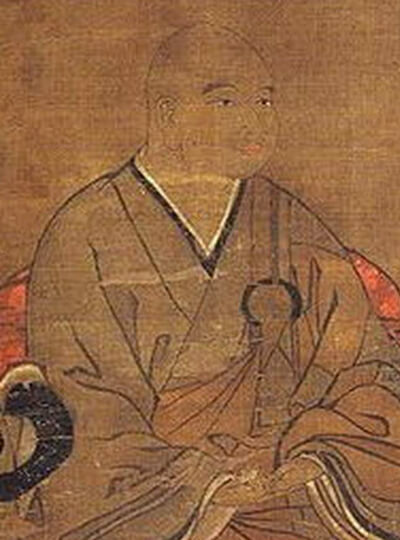 The word is originally given by the Zen monk Mugaku Sogen to Hojo Tokimune, who was carrying out various country defense measures in the 13th century, and went to meet him as a teacher before a Mongol army attack during the Mongol Invasion. It means, “when prepared sufficiently, you should advance straight towards what you believe, while ignoring embarrassment and excess desires.” Tokimune made up his mind after hearing these words, and fought together with his vassals to overcome the national crisis. 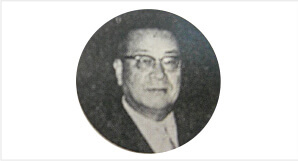 In Japan, Nomura Gomei Kaisha began exporting and importing with Nomura East India Shokusan Boueki, and soon after, “Yamato Land and Industry Co., Ltd.” was established and trading was handled by their “Trading Division”. The main business in the early stages was importing rubber, coffee, and vegetable fats and oils, but business increased significantly in trade volume and expansion, eventually possessing branches in China, Korea, Thailand and Vietnam. 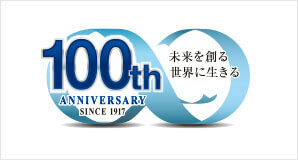 In addition, the name changed to “Yamato Industry Co., Ltd.” and after that to “Nomura Shokusan Boueki Co., Ltd.”. 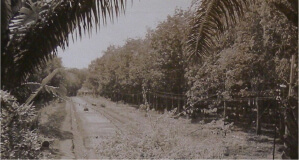 A person who wanted to invest and manage a coffee garden in Brazil visited Tokushichi on November 27, 1925 (Taisho 14). Tokushichi listened to the offer eagerly, went into investigation, and decided to purchase a farm in the heart of the mountains of the Rio Parana state in Brazil. At the time, some immigration had begun from Japan to Brazil, but the environment waiting the immigrants was not different from a slave’s harsh labor situations. Tokushichi’s aim was in investing as a capitalist, opening a farm, attracting Japanese immigrants, changing the tragic situation of immigration , and not only raising company profit, but training the people working there. 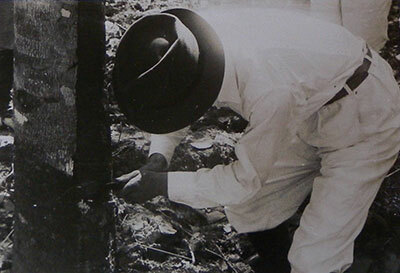 Tokushichi Nomura was also a social entrepreneur who took ahead of the times. 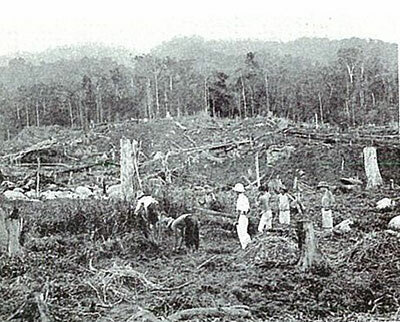 “Fazenda Nomura”, which recreated land covered up in a dense forest, was the 1st Japanese company in Brazil. It still continues to this day. 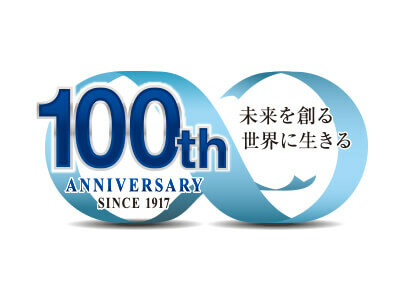 Nomura Shoten was incorporated as a corporation in 1917 when starting overseas operations, and the following year in 1918, Osaka Nomura Bank (currently Resona Bank) was incorporated, and an advance in full scale into the industrial field began. Nomura Gomei Kaisha was incorporated in 1922 and also began to manage all affiliated businesses, leading to the creation of the conglomerate. The company emblem of Nomura Trading includes the yamato mark (double mountain shape and “ト”) and the ivy, which is the family crest of the Nomura family, and Tokushichi Nomura selected it as the emblem of the Nomura business group. Although the conglomerate was dissolved, Nomura Securities, Nomura Shokusan, Nomura Construction Industrial, Nomura Real Estate Development, our company, and the others which kept “Nomura” in their name, still continue to use this emblem, but in differerent colors. Nomura group was targeted during the dissolving of conglomerates by GHQ, and the affiliated companies became independent after the war. Due to confiscation of property, it also became a start of hard times for the group. Much property in the South Pacific was confiscated, and continuation was difficult for “Nomura East India Shokusan Boueki”. The former executives and employees then established “Daiya Sangyo Co., Ltd.”. After many divisions split from”Nomura Shokusan Boueki”, only the trading department remained and became “Nomura Trading Co., Ltd.”. Because both were aiming at trade, Daiya Sangyo and Nomura Trading merged on May 25, 1951, and “New Nomura Trading Co., Ltd.” was established. 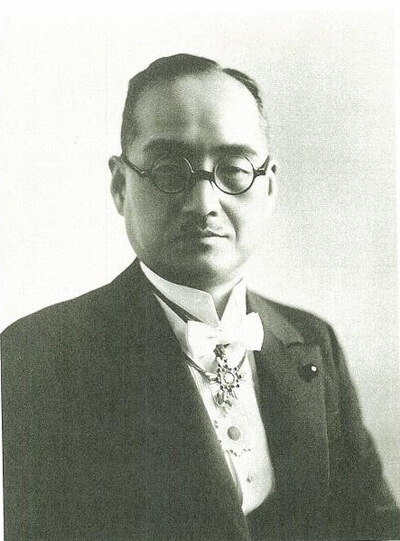 Kiyoji Ueda, who was Daiya Sagyo president, became the 1st president. He played an active part as Malay regional director of Singapore Nomura Shoten and Nomura East India Shokusan. President Ueda spoke out to the employees as follows during the embarkation of New Nomura Trading. “New Nomura Trading Co., Ltd. has shouldered new destiny, and made the first step today with bright hope. New Nomura Trading removed “New” five years after establishment, and turned into “Nomura Trading”. 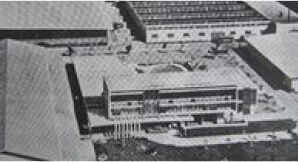 Fast growth occured during the 1950s/1960s. All employees were young, and shared the thought of re-creating Nomura. 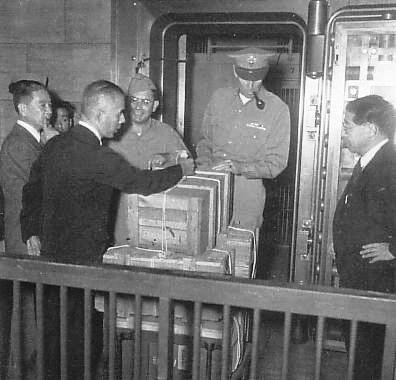 President Ueda exercised strong leadership, and he interviewed and encouraged the overseas representatives and local agents, while he flew overseas for long periods of time every year for exploring the business possibility. By the period of 1965-1974, there were 27 overseas locations, and overseas joint ventures grew from 5 in the 1950s/1960s to 12 in the 1960s/1970s. The businesses variety also increased to textiles, chemicals, seafood, metal, etc., and spread widely across 8 countries including Africa, Australia and South America but centered in Southeast Asia. Establishing many joint-ventures in the countries in Southeast Asia trained the light industries in this area, and led to increased employment and income. Although economic disparity problems in many countries attracted attention, Nomura’s joint ventures establishment during this time contributed to more equality in these countries with disparity. For opening ceremony during these times, we were graced with the presence of the king and queen of Thailand, and the President of Indonesia. Because the Nomura group was chosen as a conglomerate by GHQ to be dissolved, the companies previously under Nomura Gomei Kaisha became independent. The trading division of Nomura Shokusan Boueki became Nomura Trading Co., Ltd., but the real estate and the Agriculture/Forestry departments split and became Nomura Construction Industrial Co., Ltd. Later, Nomura Shokusan Co., Ltd., separated and they both continue today. Nomura Bank turned into the Daiwa Bank in 1948, merged with other banks in 2003, and turned into Resona Bank Co., Ltd. Nomura Real Estate and Nomura Research Institute have split from Nomura Securities, Inc. Nomura Mining later split into Hokko Chemical, Inc., and Nomura Kosan, Inc., and both continue today. Currently, the term “Nomura group” is only used by those companies affiliated with Nomura Holdings Inc of Nomura Securities. The first oil crisis of 1973 and the second oil crisis of 1978 continued, and manufacturers were troubled with depression and profit got worse in Japan, included in a low-growth phase which reduced the commission rate and led manufacturers to begin direct trade, not depending on a trading company has increased. A strong yen against the dollar is more developed at a stroke by the Plaza Accord in September 1985, and Japanese export industry and trading company received a serious blow, and big reformation has occurred to the Japanese industrial structure. Also after that, it shook with the collapse of the bubble economy, and the influence of trading companies had was a serious thing. The net sales and the profit were depressed, and Nomura trading also suffered, but because a balance of business composition was good originally, it followed and overcame import and expansion of tripartite trade. In 1997 (Heisei 9), the Asian currency crisis which started with the devaluation of Thailand, the trading companies underwent enormous influence due to huge investment in Southeast Asia. 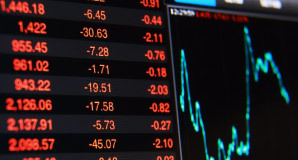 Many trading companies tackled structural reform aiming for survival. Although there was also some companies which wore the wave of reorganization of merger and acquisition, Nomura Trading chose the way to survive independently, and tackled structural reform as a whole company as one body. 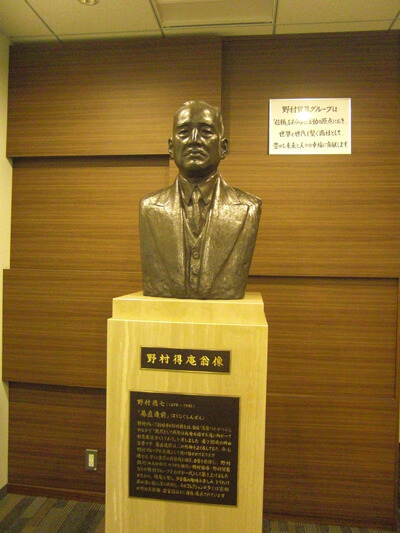 There is Tokushichi Nomura’s statue in a receptionist of the Nomura Trading Co., Ltd. Tokyo head office. It is old, since the damage had arisen in many parts, it had been kept carefully in the Osaka head office, but it was restored by volunteers in 2004 (Heisei 16). An explanation was made of Tokushichi’s record on a pedestal of a statue, and it was also to be embedded. In this way, the bust which became new is still looking at the visitor and the employee every day. Activity of this team became various forerunners for employees to move spontaneously at the severe time. Although Nomura Trading is a middle-scale trading company, it is a general trading company handling various trade materials. After the Asian currency crisis, there were some companies which took down the signboard of the general trading company and turned into a specialized trading company, but Nomura Trading maintained it. It became 3 division systems, Food Business Unit, Consumer Products and Service Business Unit and Industry Business Unit from the medium-term management plan “revival plan” implementation fiscal year in April, 2005 (Heisei 17). Food Business Unit handling food products and Consumer Products and Service Business Unit handling bedclothes are doing consistent business expansion from upstream to downstream. 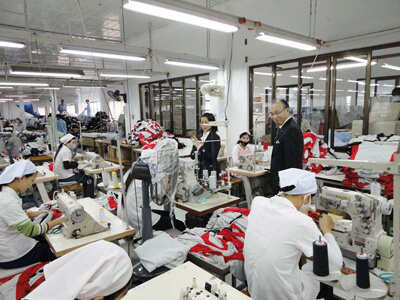 Especially in consumer Products and Service Business Unit, Nomura Fotranco was established in 1995 (Heisei 7), Nomura Thanh Hoa Garment was founded in 2007 (Heisei 19), and business deployment on upstream was strengthened. 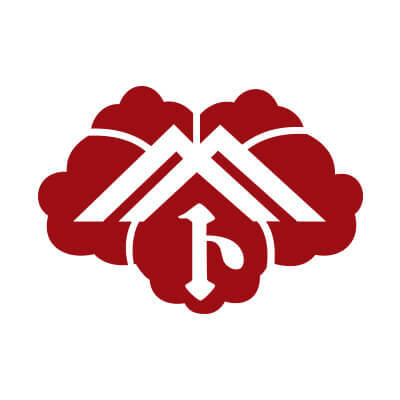 Moreover, Global Solution Division aiming at the global incubation which does not stop at the existing business style and materials was newly established in 2008 (Heisei 20). 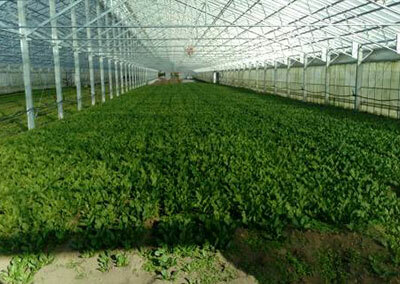 The business developed by Global Solution Division produced several results, and “Nomura Hokkaido Vegetable Garden” where production sale of the agricultural products using hot spring heat in Hokkaido was established in 2013 (Heisei 25). The corporate philosophy system which serves as a standard of management judgment and serves as an employee’s action agenda was enacted in May, 2012 (Heisei 24). In the “corporate philosophy system formulation committee” established for establishment of corporate philosophy system, all committees read the related books of the founder Tokushichi Nomura to study the origin of our sense of values, moreover, the importance of existence, the values and the mission, etc. of Nomura Trading were made clear on it and that was condensed into the words expressed most accurately. 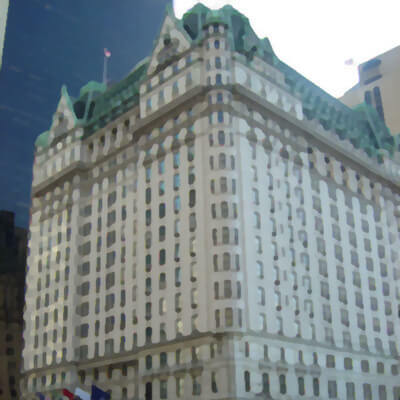 Although there was a corporate philosophy before, it was further developed and built as what is accepted by any time. President Miyashita (at that time) who tells about corporate philosophy in an overseas branch. Our medium-term management plan “Mid-Term Plan 2017+1 (Plus One)” has started new since 2016 (Heisei 28) fiscal years. The basic policy of a mid-term plan is based on our corporate philosophy, (1) Increase quality assets, (2) Development human resources, (3) Improve management system. We are tackling execution of the important measures. And, Nomura Trading celebrated its 100th year in business on May 7, 2017 (Heisei 29) when it was the 2nd year of this medium-term plan. We would like to be thankful to the pioneer people who have confronted days as severe snowstorm and have spun history and it’s our sincere desire to practice “Creating a brighter future for coming generations, achieving together with people all over the world” as our vision to connect the foundation soul with the next generation for further building up a history.